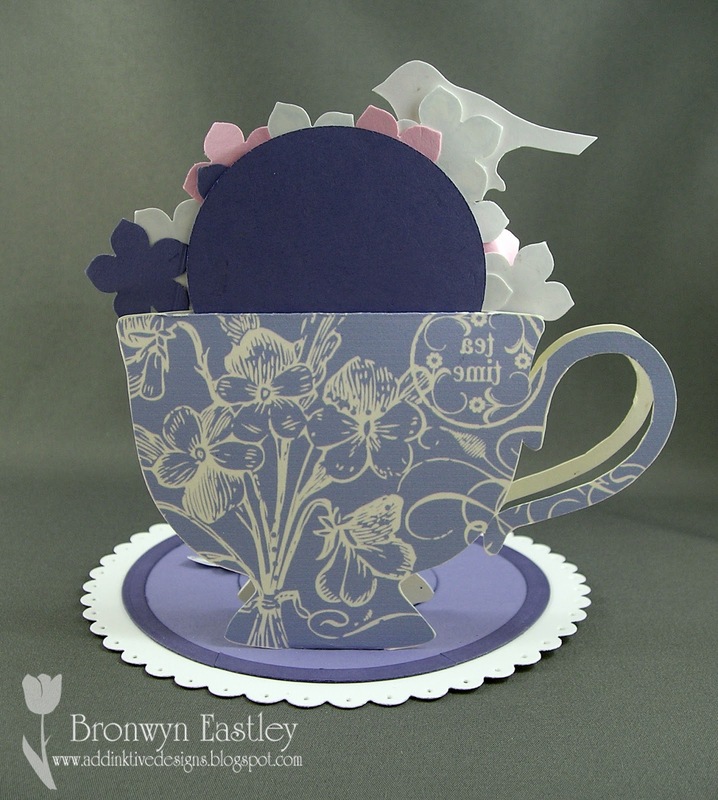 Just popping in for a quick post with a cute little project to say a fond farewell to SALE-A-BRATION 2014. 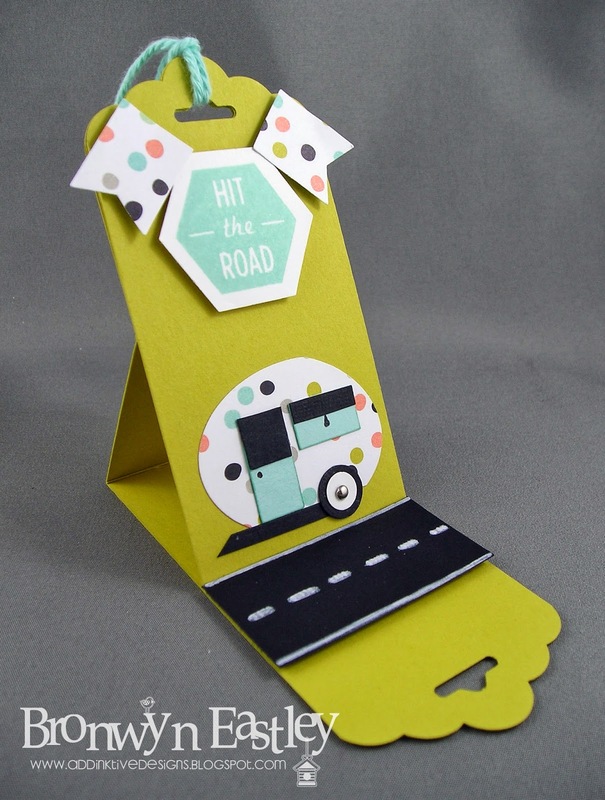 We had a beautiful and varied selection of free product to choose from (as always) and I think that the top two for me were the gorgeous Sweet Sorbet DSP and Banner Punch. 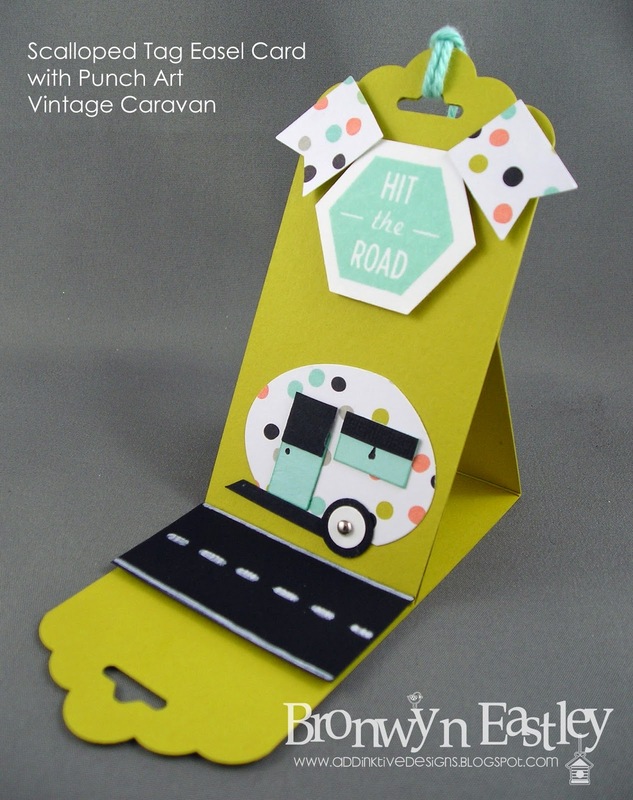 My brother is really into restoring Vintage Caravans (campers) and I bought a book for him today called, VANTASTIC - Retro Caravan Holidays in the Modern World by Kate Ulman, which inspired this bit of Punch Art on my Scalloped Tag Easel Card. 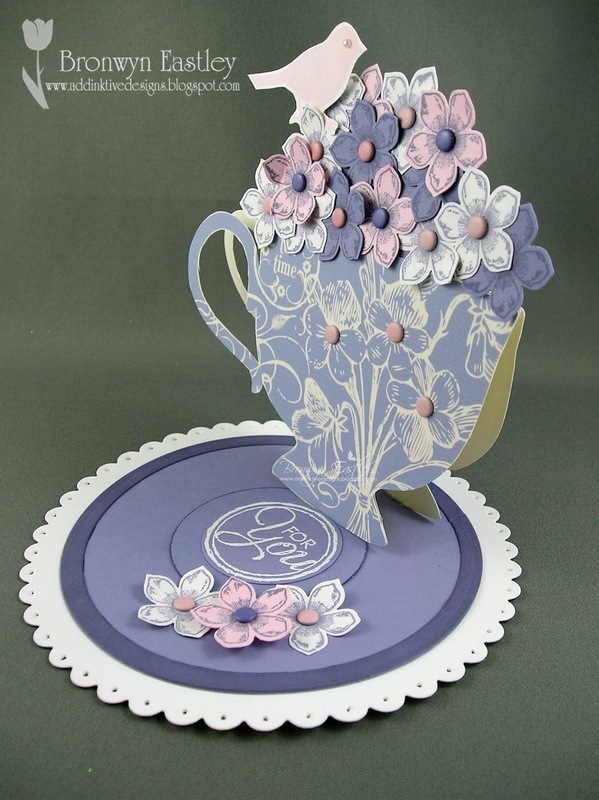 Somehow, I think that I will be back with some more caravan paper creations as I really enjoyed making this one. I'm back! 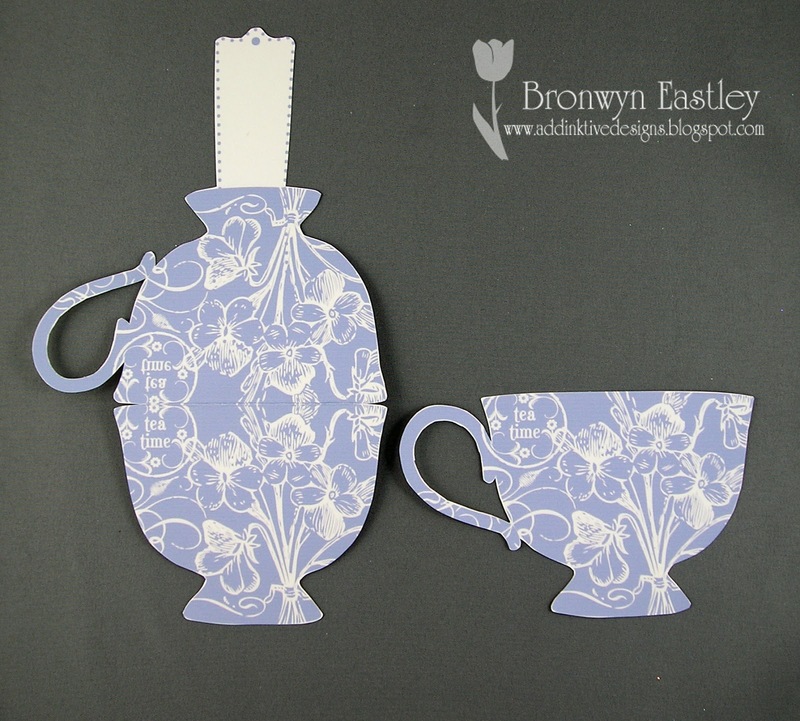 Phew ... it has been a whole fortnight since I've posted a project! 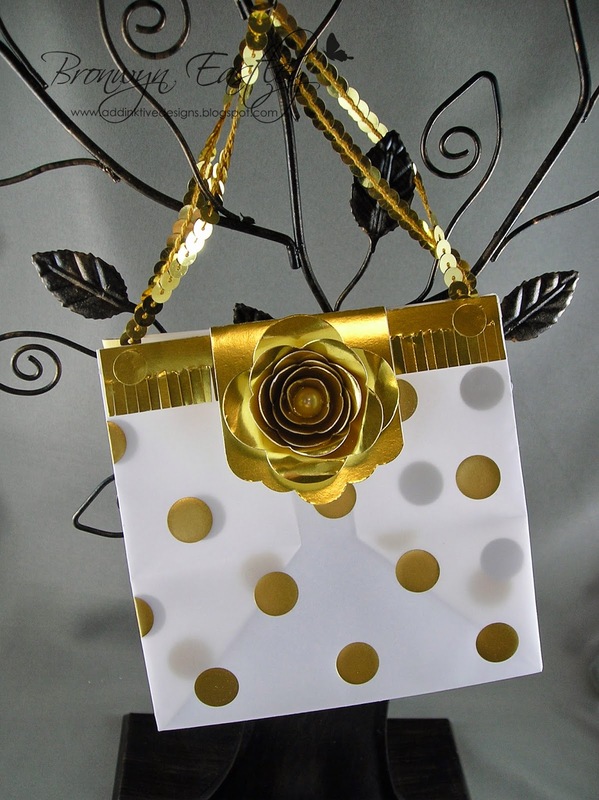 I've certainly had plenty of time to think about what I was going to make for this Boxes, Bags and Baskets Challenge for SUO but have been away on a relaxing holiday with hubby and only just arrived home on Sunday night. I loved having a break and we had a very special time eating out, snorkelling in the Barrier Reef, sight seeing in and around Port Douglas (far North Queensland), shopping, reading and relaxing by the resort pool but it's good to be home. 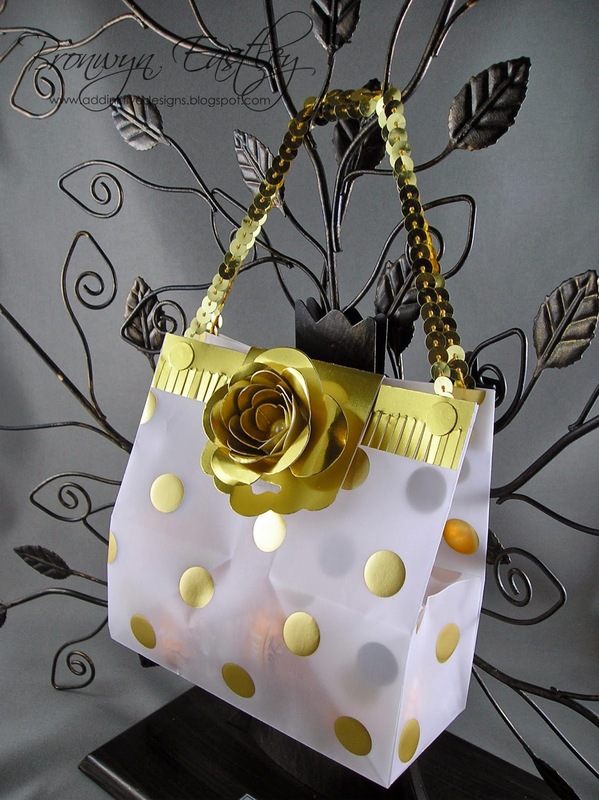 It was certainly a lot of fun to get back into my craft room yesterday and make this little glamour bag in between the loads of washing and unpacking that I had to do. 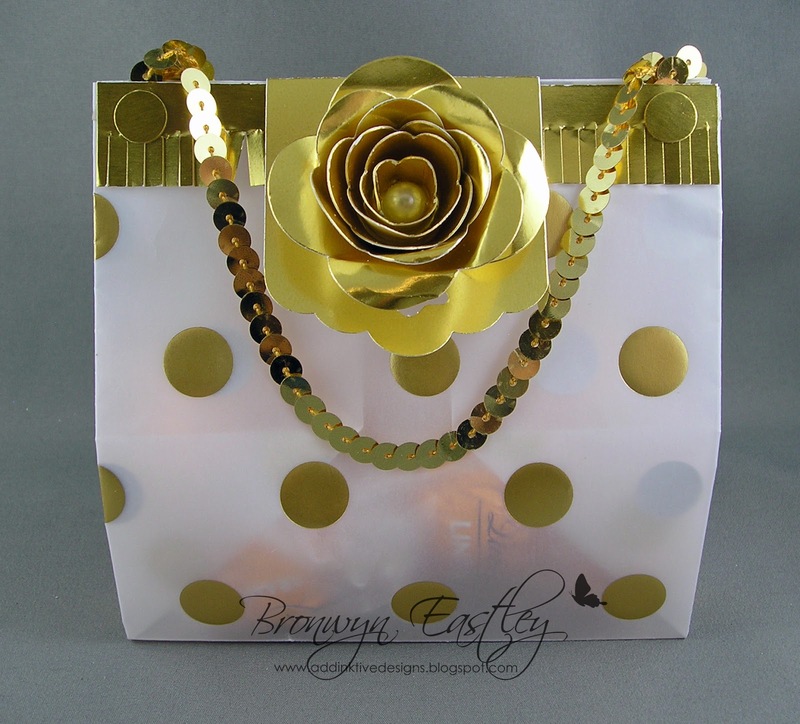 Using a piece of Fancy Foil Designer Vellum, I followed a Mini Bag Tutorial from Silvey's Craftroom then added a 3/4" x 4 1/2" Gold Foil edge, cut with the Fringe Scissors to the top of both sides of the bag, made a clasp using the Scalloped Tag Topper Punch (2" x 4 1/2"), then added some Gold Sequin Trim for the handles and finished it off with a beautiful rose made from the Spiral Flower Die and a Large Pearl. 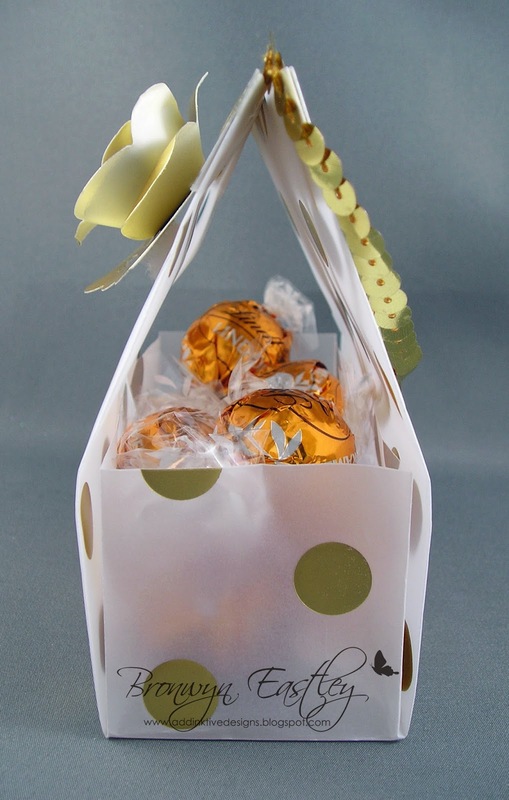 I hope you will play along over the next fortnight and share your boxes, bags or baskets with us. 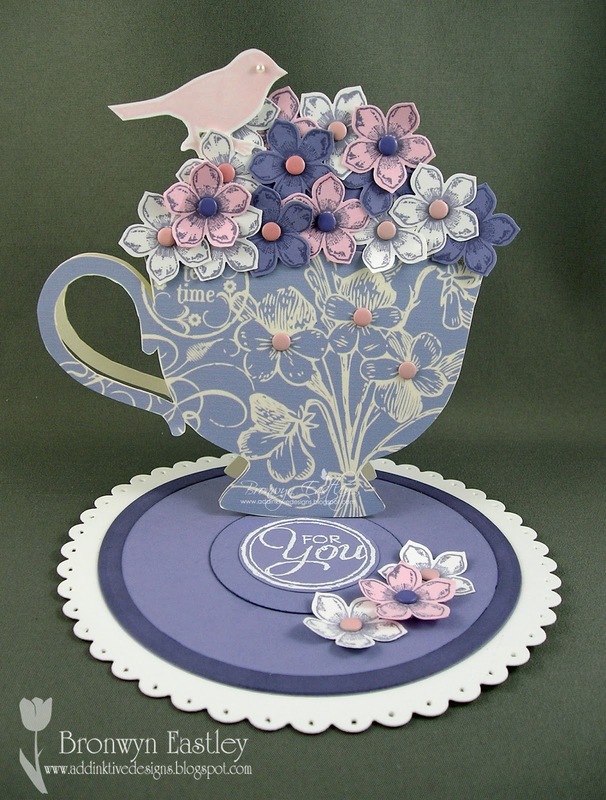 Today for the Pinks and Purples Challenge at SUO, I have made a Tea Cup Easel Card using a combination of MDS and traditional stamps, punches, inks and dies. 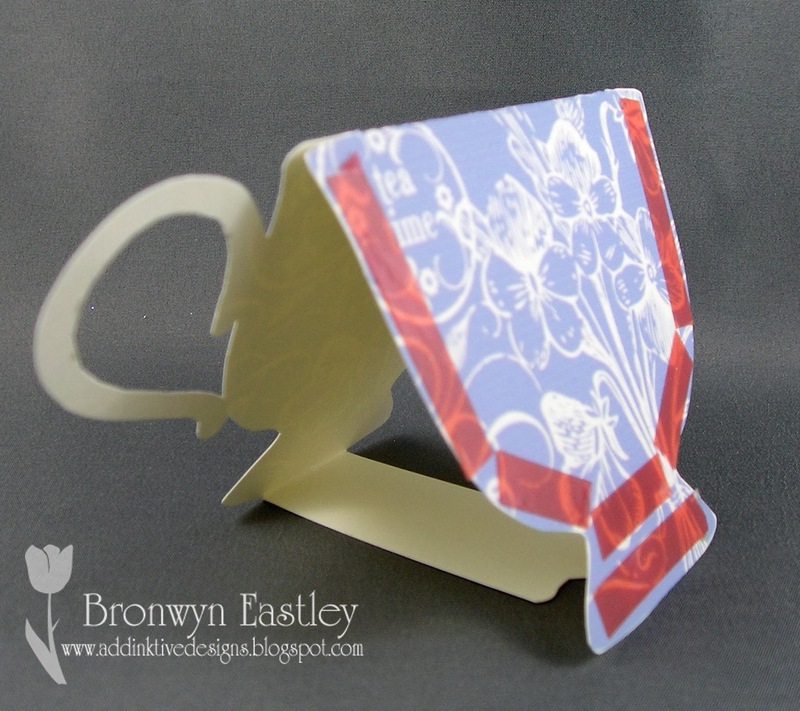 Here's a 'guide' to how I made my Teapot Easel Card. It doesn't go into great detail but I hope you can work it out from the series of photos. 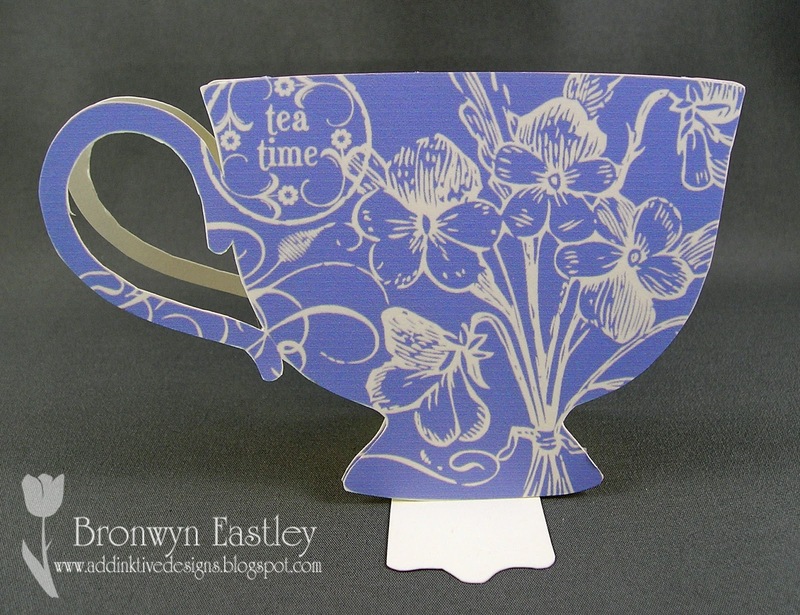 Sticky Strip was added to the front section of the card so the single tea cup could be attached to form a pocket. 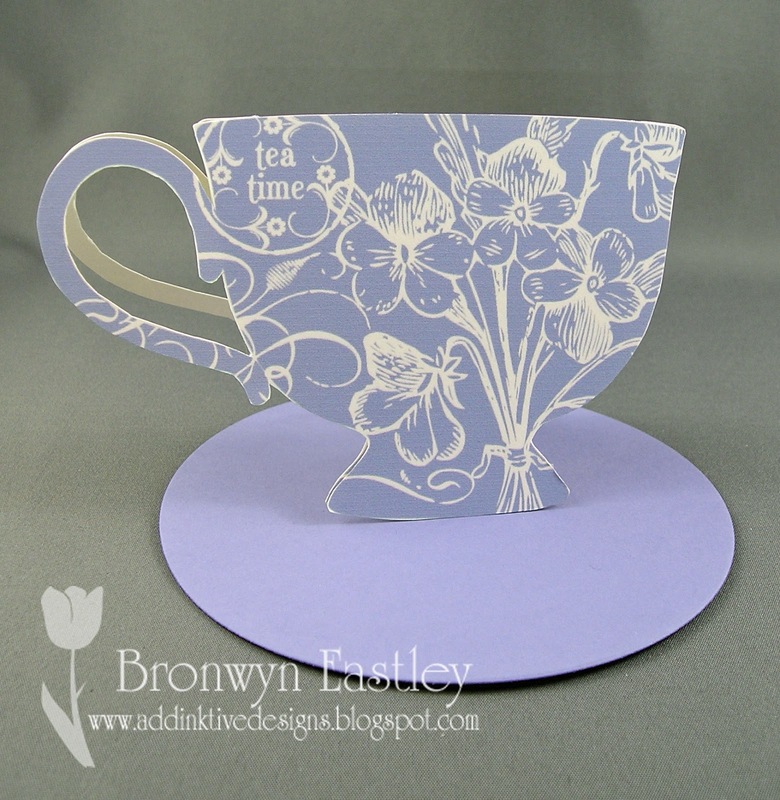 The 'saucer' was cut out from Wisteria Wonder card stock using the largest circle die. 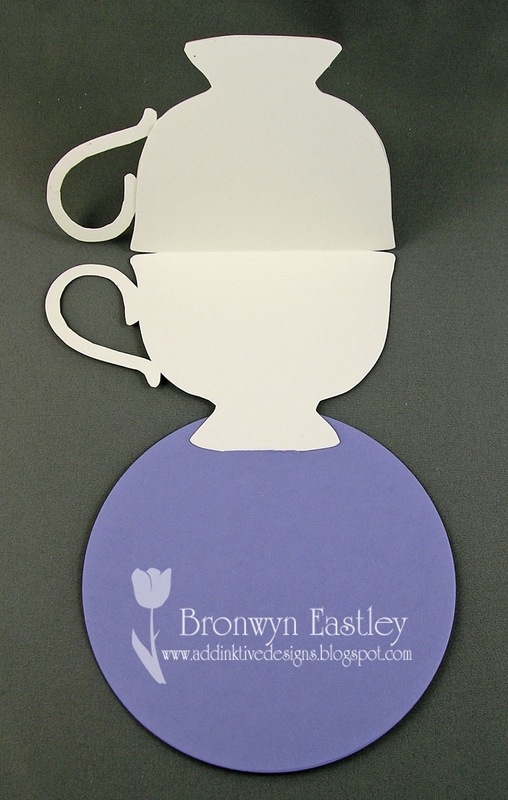 I should have made the rim of the saucer first before inserting the 'label' through a slit on the base. 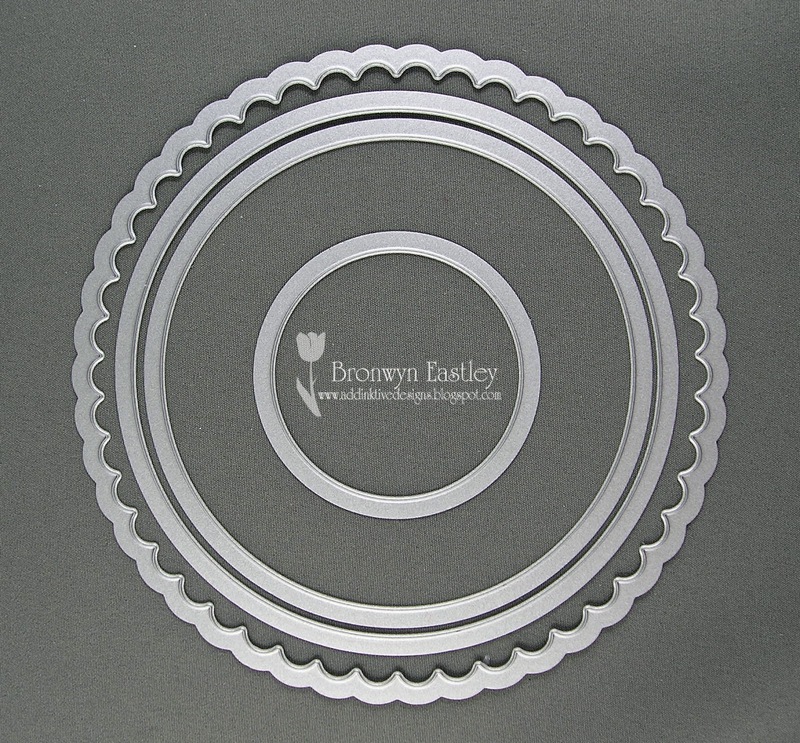 A rim was made from the two largest circle dies and sponged with WW ink. 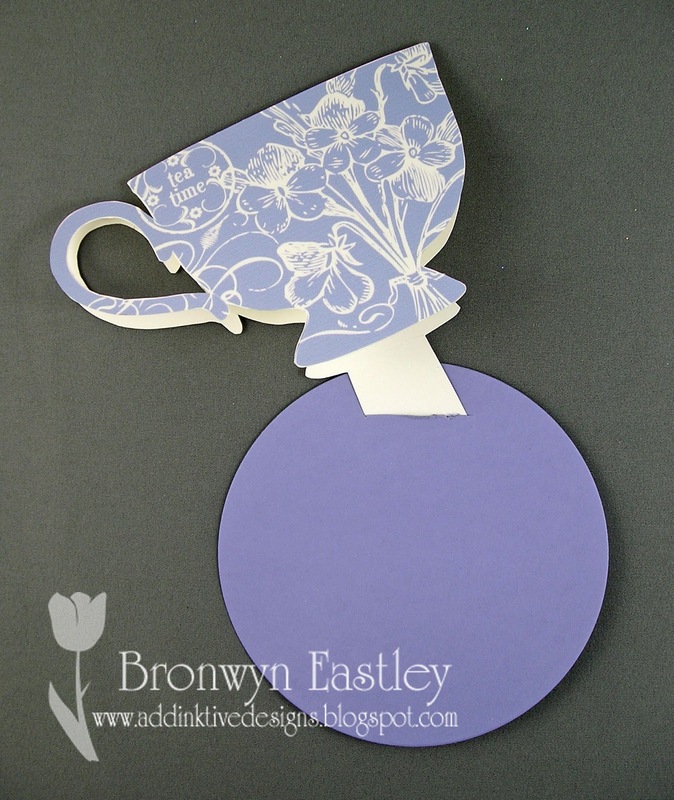 The scalloped circle was cut from Whisper White and paper pierced to form the doily. 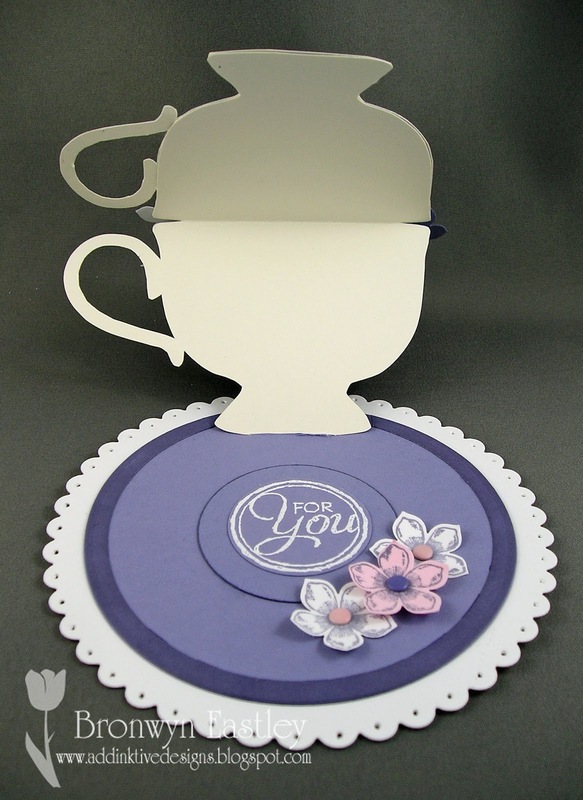 The sentiment is from Chalk Talk and heat embossed with Whisper White embossing powder. A medium sized circle was cut to form a base for the punched flowers and then inserted into the front pocket of the tea cup. 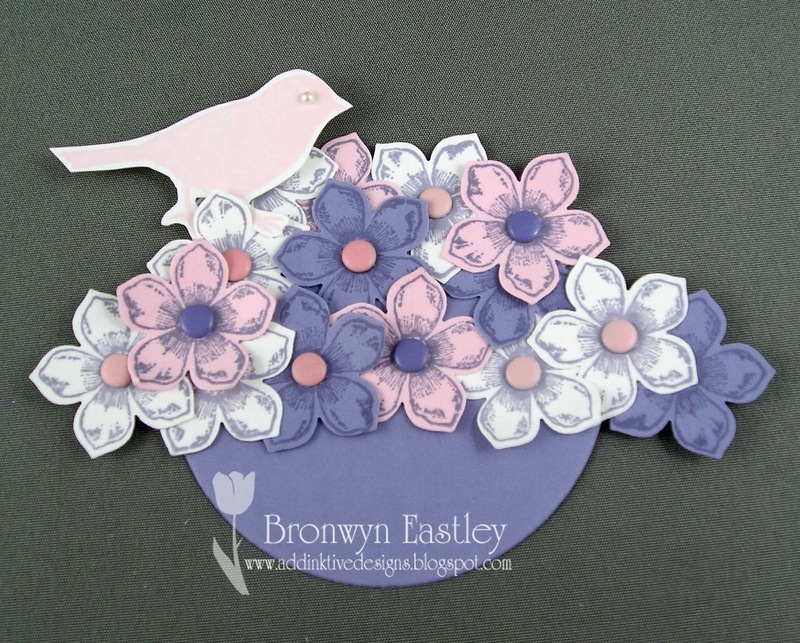 If you have any questions, you can email me in about two weeks time :) because when this post goes live I will be enjoying a well earned holiday/long service leave in sunny, North Queensland. 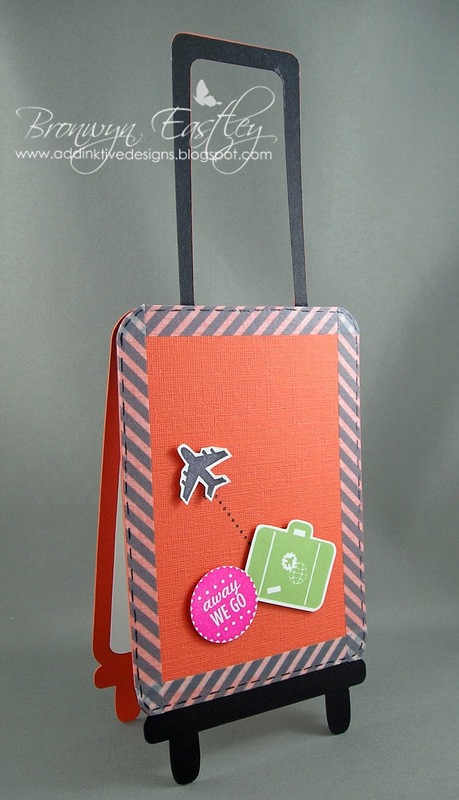 I'll be trading in my lap top and stamps for some sun, surf and relaxation! 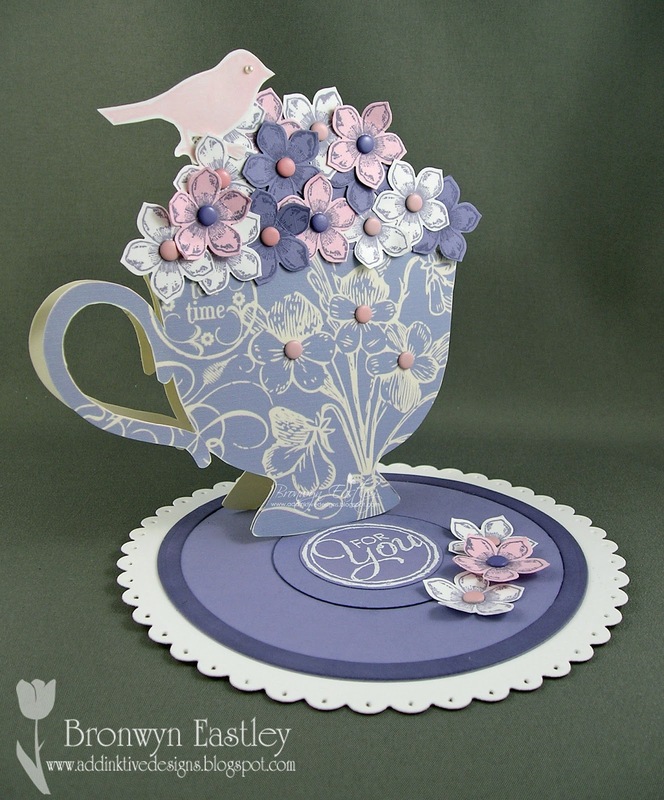 I hope you can play along over the next fortnight and share your pink and/or purple creations with us. It's never easy to say goodbye to a member of staff, especially one that has been with the school from the very beginning. 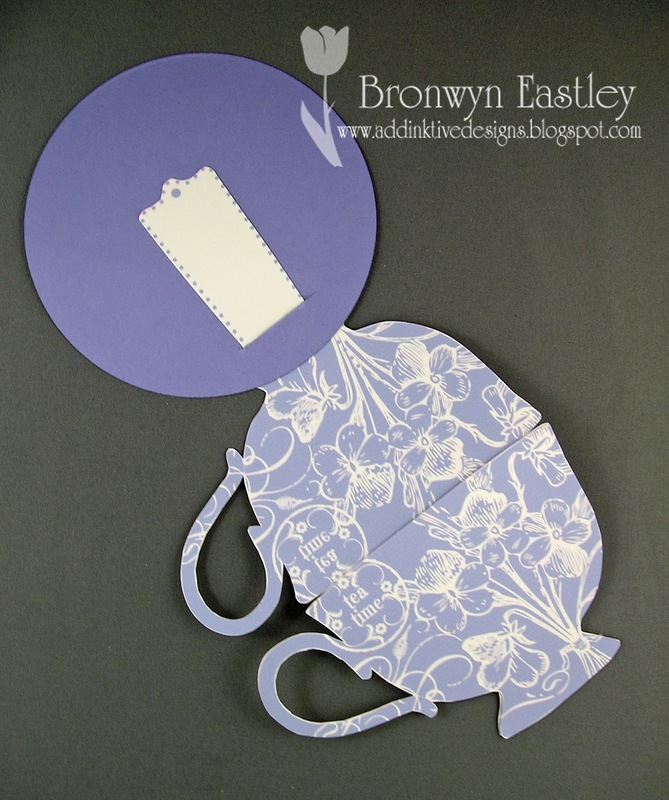 An extra special card was needed and seeing that the family are moving to WA, I thought a card in the shape of a suitcase would be pretty appropriate. One of her favourite colours is orange and I had no idea that she had just bought a set of orange luggage for the big move! 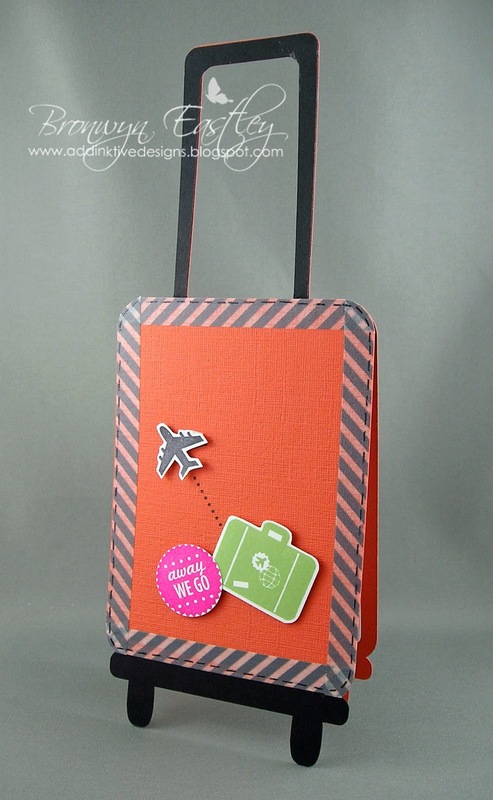 The suitcase card base was e-cut from a Silhouette download from Tangerine Tango and Basic Black Card Stock. 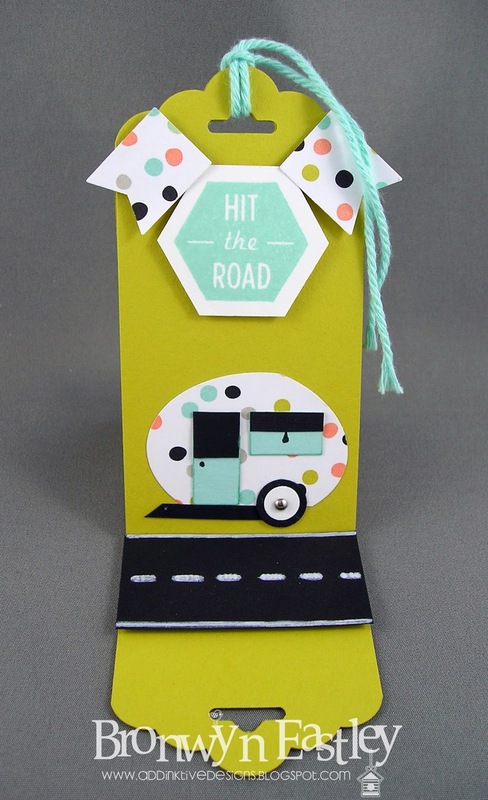 After I had taken the photos I decided to add a couple more layers so there was more room for people to write messages inside and some chevron ribbon to hold the glued handles together. 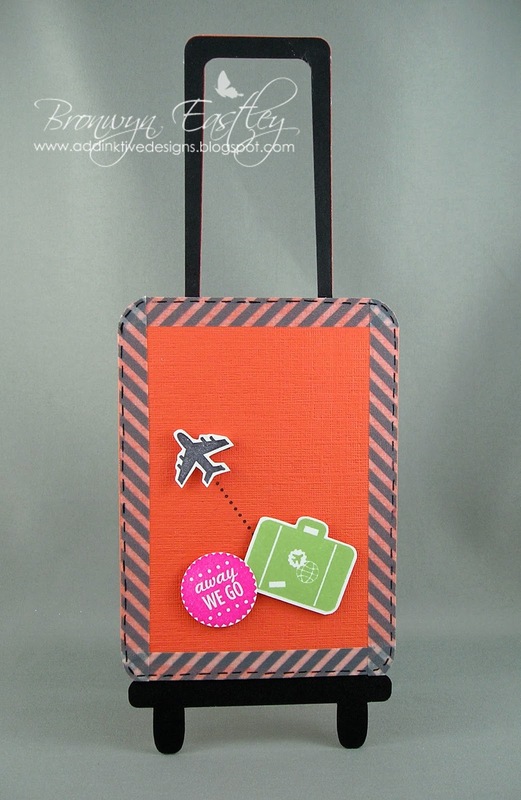 Washi Tape and faux stitching made a great 'frame' for the stamped images from the Around the World Set and the finished colour combo was Tangerine Tango, Basic Black, Whisper White, Melon Mambo and Wild Wasabi.